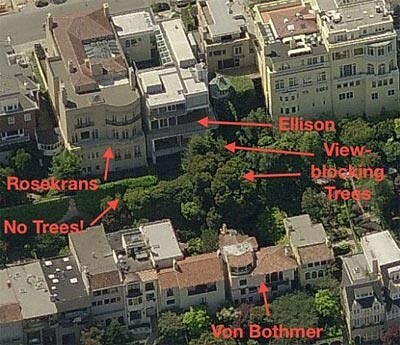 This posting on your website is completely incorrect as it said Larry Ellison paid his neighbor to cut their trees. Here are the facts: The VBs had purchased a home in 2004 with mature, massive trees (In 2004, the 80-100 year old acacia was listed as largest of its species in the state, the redwoods were planted in 1959) that gave them privacy and enjoyment, as house is built around their backyard gardens. There were no disclosures of view easements and prior owner signed legal Declaration that he never topped trees for LE even though he was asked to around 1995. VBs thinned and lowered their trees several times for LE prior to the lawsuit, and offered to top them even more if he wouldn’t sue them, but they weren’t willing to remove or significantly cut trees down to 2nd level floor required, as they had evidence trees were obstructing views since late 1950s. They didn’t want to move as they loved their beautiful home and gardens. They decided it wasn’t worth it, so they just topped their redwoods down the floor of LE’s of 2nd level (22+ feet) and topped their acacia and other trees as well. No money changed hands.